Czechoslovakia was created with the dissolution of Austria-Hungary at the end of World War I. In 1918, a meeting took place in Pittsburgh, Pennsylvania, United States, where the future Czechoslovak president Tomáš Garrigue Masaryk and other Czech and Slovak representatives signed the Pittsburgh Agreement, which promised a common state consisting of two equal nations, Slovaks and Czechs. Soon after, the philosophy of Edvard Beneš pushed for greater unity and a single nation. Some Slovaks were not in favour of this change, and in March 1939, with pressure from Adolf Hitler, the First Slovak Republic was created as a satellite state of Germany with limited sovereignty. 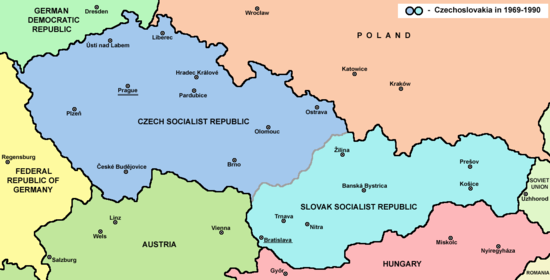 Occupation by the Soviet Union after World War II oversaw their reunification into the third Czechoslovak republic. In 1968, the Constitutional Law of Federation reinstated an official federal structure (of the 1917 type), but during the "Normalization period" in the 1970s, Gustáv Husák (although a Slovak himself) returned most of the control to Prague. This approach encouraged a regrowth of separatism after the fall of communism. By 1991, the Czech Republic's GDP per capita was some 20% higher than Slovakia's. Transfer payments from the Czech budget to Slovakia, which had been the rule in the past, were stopped in January 1991. Many Czechs and Slovaks desired the continued existence of a federal Czechoslovakia. Some major Slovak parties, however, advocated a looser form of co-existence and the Slovak National Party complete independence and sovereignty. In the next years, political parties re-emerged, but Czech parties had little or no presence in Slovakia, and vice versa. In order to have a functioning state, the government demanded continued control from Prague, while Slovaks continued to ask for decentralization. In 1992, the Czech Republic elected Václav Klaus and others who demanded either an even tighter federation ("viable federation") or two independent states. Vladimír Mečiar and other leading Slovak politicians of the day wanted a kind of confederation. The two sides opened frequent and intense negotiations in June. On 17 July, the Slovak parliament adopted the declaration of independence of the Slovak nation. Six days later, Klaus and Mečiar agreed to dissolve Czechoslovakia at a meeting in Bratislava. Czechoslovak president Václav Havel resigned rather than oversee the dissolution which he had opposed; in a September 1992 opinion poll, only 37% of Slovaks and 36% of Czechs favoured dissolution. The separation occurred without violence, and was thus said to be "velvet", much like the "Velvet Revolution" that preceded it, which was accomplished through massive peaceful demonstrations and actions. In contrast, other post-communist break-ups (such as the Soviet Union and Yugoslavia) involved violent conflict. Czechoslovakia is the only former socialist state to have an entirely peaceful breakup. A number of reasons are given for the dissolution of Czechoslovakia, with the main debates focusing on whether dissolution was inevitable or whether dissolution occurred in conjunction with, or even in contrast to, the events that occurred between the Velvet Revolution of 1989 and the end of the joined state in 1992. Those who argue from the inevitability stance tend to point to the differences between the two nations, which date back to the Austro-Hungarian Empire, and other issues. There are ethnic differences between the Czechs and Slovaks. These issues included, but were not limited to, problems with the shared state during communism, the success of the communist state in Czech lands and its failure in the Slovak lands which still resulted in the adoption of communism, because the Czechs were more influential in the running of the state than Slovaks, and the 1968 constitution, which had a minority veto. Those who argue that events between 1989 and 1992 led to dissolution point to international factors such as the breakaway of the Soviet satellite nations, the lack of unified media between the Czech and Slovak republics, and, most importantly, the actions of the political leaders of the two nations (most specifically the disagreements between prime ministers Klaus and Mečiar). Since the coat of arms of Czechoslovakia was a composition of those of the historic geographic areas forming the country, each republic simply kept its own symbol – the Czechs the lion and the Slovaks the double cross. The same principle was applied to the two-part bilingual Czechoslovak national anthem that comprised two separate pieces of music, the Czech stanza Kde domov můj and the Slovak stanza Nad Tatrou sa blýska. Disputes occurred only with respect to the Czechoslovak national flag. During the 1992 negotiations about the details of dissolution of Czechoslovakia, on demand made by Vladimír Mečiar and Václav Klaus, a clause forbidding the use of the state symbols of Czechoslovakia by its successor states was inserted into the Constitutional Law about the Dissolution of Czechoslovakia. From 1990 to 1992, the red and white Flag of Bohemia (differing from the Polish flag only by the proportion of the colours) officially served as the flag of the Czech Republic. Eventually, after a search for new symbols, the Czech Republic unilaterally decided to ignore the constitutional law on the dissolution of Czechoslovakia (article 3 of law 542/1992 says the "Czech republic and Slovak republic shall not use the national symbols of the Czech and Slovak Federative Republic after its dissolution.") and to keep the Czechoslovak flag with an altered meaning. The newly born countries were able to solve the difficulties via mutual negotiations, financial compensation and, finally, an international treaty covering the border modifications. People living or owning property in the border area, however, continued to experience practical problems until both new countries entered the Schengen Agreement Area in 2007, after which the borders became less significant. Most federal assets were divided in a ratio of 2 to 1 (the approximate ratio between the Czech and Slovak population within Czechoslovakia), including army equipment, rail and airliner infrastructure. Some minor disputes (e.g. about gold reserves stored in Prague, federal know-how valuation) lasted for a few years after dissolution. 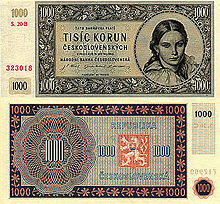 Initially the old Czechoslovak currency, the Czechoslovak koruna, was still used in both countries. Fears of economic loss on the Czech side caused the two states to adopt two national currencies as early as 8 February 1993. At the beginning, the currencies had an equal exchange rate, but later on, for most of the time, the value of the Slovak koruna was lower than that of the Czech koruna (up to ca. 30%, in 2004 around 25–27%). Starting on 2 August 1993, the two currencies were distinguished by different stamps first affixed to and then printed on the old (Czechoslovak koruna) banknotes. On 1 January 2009 Slovakia adopted the Euro as its currency with the exchange rate of 30.126 SK/€, and the €2 commemorative coin for 2009, Slovakia's first, featured the 20th anniversary of the Velvet Revolution in remembrance of the common struggle of the Czechoslovak people for democracy. By a quirk of fate, the welcoming speech on the behalf of the European Union on the occasion of Slovakia's entry to the Eurozone was delivered by Mirek Topolánek, the prime minister of the then-EU presiding country, the Czech Republic, naturally in his native language while other guest speakers used English. The Czech Republic continues to use the Czech koruna, or crown. 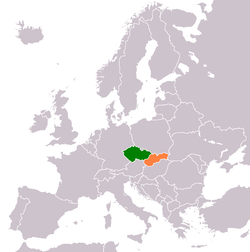 Neither the Czech Republic nor Slovakia sought recognition as the sole successor state to Czechoslovakia. This can be contrasted to the dissolution of the Soviet Union, where the Russian Federation was recognized as successor state to not only the RSFSR but the USSR itself. Therefore, Czechoslovakia's membership in the UN ceased upon dissolution of the country, but on 19 January 1993 the Czech and Slovak Republics were admitted to the UN as new and separate states. With respect to other international treaties the Czechs and Slovaks agreed to honour the treaty obligations of Czechoslovakia. The Slovaks transmitted a letter to the Secretary General of the United Nations on 19 May 1993 expressing their intent to remain a party to all treaties signed and ratified by Czechoslovakia, and to ratify those treaties signed but not ratified before dissolution of Czechoslovakia. This letter acknowledged that under international law all treaties signed and ratified by Czechoslovakia would remain in force. For example, both countries are recognized as signatories of the Antarctic Treaty from the date Czechoslovakia signed the agreement in 1962. Both the Czech and Slovak Republics have ratified the Vienna Convention on Succession of States in respect of Treaties. However, it was not a factor in the dissolution of Czechoslovakia since it did not enter into force until 1996. Many Czechs hoped that dissolution would quickly start an era of high economic growth in the Czech Republic (without the need to "sponsor the less developed Slovakia"). Similarly others looked forward to a stand-alone, unexploited Slovakia which might become a new "economic tiger". According to The Prague Post, "Slovak GDP reached 95 percent of the Czech GDP, and it is likely to draw level with it. The Slovak gross national product (GNP), which includes citizens' incomes abroad and deducts the money multinational companies move out of the country, is higher than the Czech one. Old-age pensions are more or less at the same level in both countries, and the consumption per capita is slightly higher in Slovakia. However, salaries are 10 percent lower on average in Slovakia than in the Czech Republic. But Martin Filko, head of the Institute of Financial Policy of the Slovak Finance Ministry, pointed out that Slovakia is among the EU countries where salaries form the lowest portion of GDP. In other words, a part of people's incomes comes from sources other than their main employment, and this reduces the real difference between the Czech and Slovak salaries, Respekt says. Slovakia has higher political stability than the Czech Republic: as of 2018, Slovaks have had only four prime ministers since 1998, while the Czechs have had ten. Slovaks have become a more integral part of the EU thanks to their adoption of the euro, and they are more resolved to take part in the banking and fiscal unions, Respekt writes. In the Czech Republic, the right wing opened the economy, and the left wing privatized banks and attracted foreign investors. Until 2005 the GDP of the two countries was growing at a similar rate. But in 2005–08, the Slovak economy grew faster than the Czech one. Economists agree this was thanks to the right-wing reforms of the Mikuláš Dzurinda government and the promise of the euro adoption, which attracted investors. When left-wing populist Robert Fico replaced Dzurinda as Slovak prime minister after eight years in 2006, he reduced the right-wing reforms only moderately, but he did not abolish them, unlike the Czech Social Democrats (ČSSD). In this period, the Czechs had three ČSSD prime ministers in four years (2002–06), followed by a shaky center-right cabinet that cut and simplified taxes but failed to push through other reforms and did not want to adopt the euro, due to the financial crisis and the Civic Democrats’ (ODS) ideological stance. Since the federalization in 1968, Czechoslovakia had divided citizenship, either of the Czech Socialist Republic or of the Slovak Socialist Republic (the word 'Socialist' was dropped from both names shortly after the Velvet Revolution). This distinction, however, had little effect on the citizen's life. On January 1, 1993, all Czechoslovak citizens automatically became citizens either of the Czech Republic or the Slovak Republic, based on their previous citizenship, permanent residence address, birthplace, family ties, job, and other criteria. Additionally, people had one year's time to claim the other citizenship under certain conditions. Slovak legislation allowed dual citizenship until 2010 when this possibility was abolished (see Citizenship Act (Slovakia)). Only a handful of people have exercised this right; however, the significance of this is lessened by both nations' membership in the EU as the freedom of movement for workers policy guarantees EU citizens the right to work and live anywhere in the Union. In the case of movement between the Czech Republic and Slovakia, this policy took effect from 2004. By contrast, the Czech Republic has formerly prohibited dual citizenship for naturalized citizens, requiring them to give up existing citizenship(s) prior to receiving citizenship of the Czech Republic. This requirement could only be waived if giving up an existing citizenship might put the applicant or their relatives in danger of persecution in their homeland, which was not the case of applicants from Slovakia. This situation changed with the new Citizenship Act of 2013 (186/2013 Sb. ), in force since January 1, 2014. However, most Slovak citizens are still unable to become dual citizens of both the Czech Republic and Slovakia, since they automatically lose Slovak citizenship upon voluntarily acquiring another one (see previous paragraph). Exempt from this law are only those Slovak citizens who obtain a foreign citizenship by virtue of marriage with a foreign national. Some Slovak politicians have speculated in the media about softening the Citizenship Act, but no change has yet materialized as of January 2015. People of both countries were allowed to cross the border without a passport and were allowed to work anywhere without the need to obtain an official permit. Border checks were completely removed on 21 December 2007 when both countries joined the Schengen Agreement. Customs union between the Czech Republic and Slovakia remained in place from the dissolution until May 1, 2004, when both countries entered the European Union. Under the current European regulations, citizens of either country are entitled to the diplomatic protection of any other EU country and, therefore, the Czech and Slovak Republics have been considering merging their embassies together with nations of the Visegrád Group in order to reduce costs. One of the problems not solved during dissolution was the question of a large number of Romani living in the Czech Republic, who were born and officially registered in today's Slovakia. Most of them did not re-register their official place of stay during the months before dissolution, and so the question of their citizenship was left open. The 1992 Czech Nationality Act allowed a grant of automatic citizenship only to those born on Czech territory. For others, the right to citizenship required proof of a five-year period of residence, an "unobjectionable" criminal record, significant fees and a complicated bureaucratic process; this reportedly excluded a rather large percentage of Roma. The Slovak government did not want to grant citizenship to non-residents. Significant numbers of Roma living in Czech orphanages did not have their legal status clarified, and were released from care as adult non-citizens without any right to work or live in the Czech Republic. Under pressure from the European Union, the Czech government made amendments to its nationality law in 1999 and 2003 which effectively solved the problem; however, compensation has not been provided to those rendered stateless in 1992. In the former Czechoslovakia, the first television channel was a federal one and the Czech and Slovak languages were used in equal ratios in the TV news there, although foreign films and TV series were almost exclusively dubbed into Czech, for example. This (and the fact that the languages are very similar) made almost all people of both nations passively bilingual, i.e., they were able to understand but not necessarily speak the other language. After the dissolution in 1990s the new TV channels in the Czech Republic practically stopped using Slovak, and young Czech people now have a much lower understanding of the Slovak language. Also, the number of Slovak-language books and newspapers sold in the Czech Republic dropped drastically. The Czech TV news, however, started to reintroduce Slovak-language coverage from Slovakia and Slovak TV (STV2) rebroadcasts the Czech TV newscast Události ČT daily, ten minutes after midnight. On the public RTVS, it is common to have at least one daily newscast from the Czech Republic during prime time news. Furthermore, many TV programmes on Slovak TV channels are still dubbed into Czech, some films in cinemas are subtitled in Czech and there are far more Czech-language books and periodicals on the market than before the dissolution. The major boost for the language interchange has come from private TV channel providers like CS Link (Czech Republic) and Sky Link (Slovakia) that offer Slovak channels in the Czech Republic and vice versa. Additionally, several channels, regardless of their national origin, offer programs both in Czech and Slovak (CSFilm, TV Barrandov) or even mix like TV Nova's Nova Sport coverage of the English Premier League. New impulses to mutual contacts coming via TV are also common shows like the Intelligence Test of Nations, Czechoslovakia's Got Talent broadcast by PRIMA and TV JOJ, and Czecho-Slovak SuperStar, the latter being the first international edition of the Pop Idol song contest broadcast by TV Nova and Markíza, which also organized joint versions of MasterChef and The Voice in 2012. Also, the New Year's Eve Program for 2009 was prepared and broadcast jointly by ČT and STV and for 2010 by the Czech TV PRIMA and the Slovak TV JOJ, this time even including the singing of the Czechoslovak national anthem. Young Slovak people still have the same knowledge of the Czech language as their predecessors, if not better. Even today, in Slovakia, Czech may be used automatically in all judicial proceedings, plus all documents written in Czech are acknowledged by Slovak authorities, and vice versa. Further, the Slovak Official Language Act passed in 2009 did reconfirm the right of Czechs to use their language in all official communication when dealing with Slovak authorities (however, the Act explicitly limited the use of Czech in Slovakia only to persons with Czech as their mother tongue). The same is true about using the Slovak language in the Czech Republic owing to the Administration Procedure Act of 2004. Gustáv Slamečka, a Slovak citizen who was the Czech transport minister (2009 - 2010), used the Slovak language exclusively in his official communication. For the language comparison see differences between Slovak and Czech languages. The official break-up occurred right in the middle of the 1993 World Junior Ice Hockey Championships, which took place in Sweden. The team representing Czechoslovakia was called "Czech-Slovak" starting on 1 January. In international ice hockey tournaments, the Czech Republic took over Czechoslovakia's place in the A-groups, while Slovakia had to start in the lower divisions. During the FIS Nordic World Ski Championships 1993 in Falun, Sweden, the ski jumping team competed as a combined Czech Republic-Slovakia team in the team large hill event, winning a silver. The team had been selected prior to the dissolution. Jaroslav Sakala won two medals in the individual hill events for the Czech Republic at those games along with his silver in the team event. The mutual encounters between the national teams of the two countries in many sports are followed by a majority of the populations, and the number of players and coaches active in the other republic is significant. Martin Lipták, a Slovak handball coach, successfully led the Czech national team to the EHF 2010 Handball European Championship in Austria. A Slovak team under his coaching, Tatran Prešov, won the Czech national league in 2008 and 2009. Czech ice hockey coach Vladimír Vůjtek led the Slovak national team to the silver medal at the 2012 IIHF World Championship, having beaten the Czech team in the semifinals. Several sports did or do feature a common league, and discussions about having a common football or ice hockey league continue. The two successor states continued to use the country code +42 until 28 February 1997, when this was replaced by two separate codes: +420 for the Czech Republic and +421 for Slovakia. Since then, telephone calls between the two countries have required international dialing. Public perception of the dissolution has not changed much, with a December 2017 poll showing that just 42% of Czechs and 40% of Slovaks agree with what happened (compared to 36% and 37% in 1992, respectively). According to Czech political analyst Lubomir Kopeček, many Czechs and Slovaks view the breakup process unfavourably because they had no say in the matter. Most people would have rather had a referendum decide. In 2015, a Slovak movement called "Czechoslovakia 2018" was established to try to get a referendum by 2018. While its leader, Ladislav Zelinka, said he received thousands of emails and calls from supporters, it was unable to reach the necessary 350,000 petition signatures. The younger generations of both countries are largely indifferent to the issue, never having experienced the previous period themselves, while older generations are more focused on present issues such as immigration while also favouring their own separate nationalism. Surveys from 2010 showed that the majority of the population of Prague (Czechs) still considers the division of the country a mistake; similarly, the general representative survey in Slovakia (from 2008) showed that society is still divided in opinion on the dissolution: 47% favouring the dissolution, while 44% considering it as a mistake. Political influences between the countries are minimal, but social democrats tend to cooperate very closely on regional and European topics in recent years. Furthermore, it has become customary that the elected presidents pay their first and last official foreign visits during their term to the other republic of the former Czechoslovakia. Appointed foreign ministers tend to follow this unwritten rule. On 29 October 2012, in order to commemorate Czechoslovakia's declaration of independence, which occurred on 28 October 1918, the Czech and the Slovak governments held for the first time a joint cabinet meeting in the communities of Trenčín and Uherské Hradiště in the vicinity of the common border. Also, peace keeping troops stationed in the former Yugoslavia were put under joint command on several occasions. For example, from 2002 until July 2005, the Czech Armed Forces joined with the Armed Forces of the Slovak Republic to form a joint Czech-Slovak KFOR battalion in Kosovo that contributed to the Multinational Brigade CENTRE. Trade relationships were re-established and stabilized, and the Czech Republic continues to be Slovakia's most important business partner. After a short interruption, Slovakia's resorts in the Carpathian mountains are again the destination of a growing number of Czech tourists. Following the death of the last Czechoslovak president Václav Havel on 18 December 2011, both the Czech and the Slovak Republics observed the day of national mourning. During the funeral mass in Prague's St. Vitus Cathedral prayers were recited in an equal ratio in the Czech and the Slovak languages. ^ Kamm, Henry. "At Fork in Road, Czechoslovaks Fret", The New York Times, dateline 9 October 1992. Retrieved 1 January 2009. ^ a b Mrak, Mojmir (1999). Succession of States. Martinus Nijhoff Publishers. ISBN 978-90-411-1145-6. ^ Innes, Abby (2001). Czechoslovakia: The Short Goodbye. Yale University Press. ^ Kraus, Michael (2000). "International Forces and Factors". Irreconcilable Differences? Explaining Czechoslovakia’s Dissolution. Rowman & Littlefield Publishers, Inc.
^ Musil, Jiri (1995). The End of Czechoslovakia. Oxford University Press Inc.
^ "Czech society of vexicologists about the origin of the Czechoslovak state flag" (MS Word) (in Czech). Retrieved 10 December 2007. ^ Treaty between the Czech Republic and the Slovak Republic on Common Borders (1996)- published in Slovakia under Announcement 274/1997 Z.z. ^ "The Significance of Stamps Used on Bank Notes" (PDF). thecurrencycollector.com. Retrieved 19 November 2013. ^ "Pamätné mince 2 € – 2009". Ecb.int. Retrieved 19 November 2013. ^ "Is the Czech Republic richer than Slovakia?". Prague Post. Czech News Agency. 8 September 2014. Archived from the original on 8 September 2014. ^ "Zákon Národnej rady Slovenskej republiky o štátnom občianstve Slovenskej republiky". NR SR. January 1993. Retrieved 12 November 2014. ^ "Zákon o nabývání a pozbývání státního občanství České republiky". Česká národní rada. December 1992. Retrieved 12 November 2014. ^ "Country Report: Slovakia" (PDF). EUDO Citizen Observatory. January 2013. Retrieved 12 June 2013. ^ "Informace k novému zákonu o státním občanství ČR". Ministry of Interior of the Czech Republic. January 2014. Retrieved 11 November 2014. ^ "V4 wants common embassies". Noviny.joj.sk. Archived from the original on 16 July 2012. Retrieved 14 April 2011. ^ "Úvod | Česko Slovensko má Talent". Csmatalent.sk. 30 November 2010. Retrieved 14 April 2011. ^ "500/2004 Coll. ACT of 24th June 2004 Code of Administrative Procedure" (PDF). Ducr.cz. Archived from the original (PDF) on 7 January 2015. Retrieved 19 November 2013. ^ "Martin Lipták trénerom hádzanárov Česka". Sportky.topky.sk. 18 July 2008. Retrieved 14 April 2011. ^ pdrbjak. "Tatran Prešov Web Page". Tatranpresov.sk. Retrieved 14 April 2011. ^ "Česi i Slováci chcú spoločnú futbalovú ligu. Prekážok je ešte veľa". sport.pravda.sk. 19 November 2012. Retrieved 19 November 2012. ^ "History of Country Codes". World Country Codes. Retrieved 25 February 2015. ^ "Rozdelenie Československa: Čo hovorí pražská ulica?". Tv.sme.sk. Retrieved 14 April 2011. ^ "Slovaks have not come to terms with the breakup". Hnonline.sk. Retrieved 14 April 2011. ^ "Spoločné vyhlásenie - zasadnutie vlád Slovenskej republiky a Českej republiky". Vlada.gov.sk. Retrieved 19 November 2013. ^ "15th ACR Contingent in KFOR". Army.cz. Retrieved 19 November 2013. This page was last edited on 31 March 2019, at 14:30 (UTC).